More typically, a lack of publicly-funded dentists means that growing numbers go private: 78 percent of private patients said they were there because they could not find a National Health Service (NHS) dentist, and only 15 percent because of better treatment." This kind of thing would happen on a much larger scale here, due to the population makeup and the money to be made by abandoning the nationalized system and setting up shop privately. Last edited by Save Ferris; 10-16-07 at 08:41 AM. didn't michael moore say that english doctors make enough money working for NHS to live in the best neighborhoods? The English have problems with dentistry? Imagine that! We don't have dental problems in this country. I can see there being dental problems in the middle of Oklahoma. I have a great dental plan, have no problems getting an appointment, I can walk to my dentist's office (it's about five blocks from mine) and the level of care is excellent. Now, when you consider that my dentist and I both have the same boss (the state), this would lead you to believe that, given the type of anecdotal evidence we see here so often, a totalitarian system is the way to go. You go to a socialized dentist. Shame on you. I think the point is that it could be much worse in the US. The UK has a smaller illegal immigrant problem and a much smaller population in general. If you were a good doctor with actual skills why wouldnt you open a private practice instead of shlump for the system? So now its crystal clear. 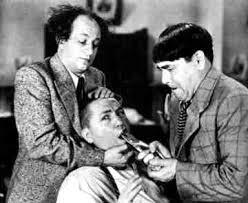 National healthcare=Tying your tooth to a doorknob. Is that what they call a straw man argument in this forum? Im new here. New? Then you should find one of the 100 national healthcare threads. Havent been to this subforum in ages. And both sides love doing it pulling out different examples based on what point they are trying to make. The new motto of socialized medicine: "Shut up, it's free." Is there really any need for a thread about this every week? I thought posters weren't allowed to post the same things over and over? Either way, we get the point already. Enough with the superiority complex. Dany Bureau, 21, and his father, Robert, from Gatineau, can't believe the ordeal they went through to get Dany's appendicitis taken care of. It was 28 hours before surgery was performed in Montreal. Dany's appendix had burst, a complication that required a longer hospital stay. When Dany Bureau's stomach started to hurt last week, he figured it was just because of something he ate. So the 21-year-old Gatineau student went to bed, thinking he'd feel better by the morning. But when he woke up the next day, the pain was still there, and it was getting worse. He headed to Gatineau Memorial Hospital, thinking that doctors would soon figure out what was ailing him and take care of it. He never imagined the ordeal that would follow: The young man was turned away from five hospitals, got lost in an ambulance and, 28 hours after he was diagnosed, he had a burst appendix removed -- in Montreal. Because Wakefield's Gatineau Memorial Hospital does not have surgical capacity, the doctor who diagnosed him with appendicitis last Friday started looking around for one that did. Usually, patients from Wakefield are sent to Hull or Gatineau, but on that night, there were no available beds at either. As his doctor hunted around for an available surgeon, Dany's "tummy ache" of the night before was turning into a searing pain in his abdomen. Meanwhile, his father, Robert, was waiting at home to find out which hospital his son would get into. He says he kept getting calls updating him as one after another of the closest hospitals couldn't help, or weren't yet responding. None in Hull, Gatineau, Buckingham, Ottawa, or Maniwaki could help. After several hours of searching for a surgeon to no avail, one was eventually confirmed in Montreal. As Dany waited for an ambulance to take him there, with the pain in his side growing unbearable, he was confused about why he had to go so far for what he thought was a simple surgery. As Dany was being loaded into the ambulance around 8:37 p.m. Friday, Robert Bureau hopped in his car and started on the two-hour journey to Montreal. "I anticipated that they would pass us on the way to the hospital, but we never saw the ambulance," he said. When he got to the hospital, there was no sign of his son -- who didn't show up for another hour and a half because paramedics took a wrong turn on the highway. "I could hear them asking directions to people outside because they didn't know where they were," Dany said. Once the paramedics had found their way, they then mistakenly unloaded their patient at the Montreal Children's Hospital before they finally delivered him to the Montreal General Hospital 15 minutes after midnight. Marc Paquette, the director of operations for the Outaouais Paramedics Co-operative, said yesterday that the paramedics did mistakenly take Dany to the children's hospital. However, he said the driver was not lost, but simply missed the Décarie exit for the hospital and turned around when he realized his mistake. Mr. Paquette added that this was an "isolated case," and that his drivers make trips to Montreal regularly. Mr. Bureau figures the trip took the paramedics about two hours more than it should have. As a result, he said, the surgeon who was awaiting Dany's arrival became involved with another trauma case. Then other trauma cases came along -- so his son was put in a bed to wait. It wasn't until 9:50 on Saturday night, after hours of pain and worrying, that Dany was finally wheeled into an operating room. "When they opened him up, it was busted. There was pus all over the place. There was dead tissue. So they cleaned it all up and they removed the appendix," Mr. Bureau said. What's worse, he added, is that Dany developed peritonitis, an inflammation that, if untreated, can be life-threatening, as it stops the normal movement of the intestines. It was his father's biggest worry. "That's all we hear in the news nowadays: Somebody gets appendicitis, they get sent home by a hospital and then they get peritonitis and die." Because of the peritonitis, Mr. Bureau said, Dany had to stay in hospital in Montreal until Wednesday so his recovery could be monitored. Citing privacy concerns, Alex Fretier, a spokesman for the Montreal General Hospital, said he could not discuss the case. He was also unable to provide information on normal waiting times for emergency appendectomies. "As a parent, I cannot believe that there is no emergency services or surgery for our area or the Ottawa area to deal with something as simple as an appendix," he said. However, those familiar with Quebec's health system say that a lack of available beds isn't that uncommon. "When you make rounds around the province of Quebec, you will see that every hospital, once in a while, won't have beds available and it happened to us last weekend," said Sylvain Dubé, spokesman for the Gatineau health and social services centre. Although the general practice is to send Outaouais patients to Montreal if there is no room at regional hospitals, the Ottawa Hospital has an agreement to take them "if there is a threat to life or limb," said spokeswoman Allison Neill, who added that their emergency rooms have also been extremely busy lately. However, Marthe Robitaille, a spokeswoman for Outaouais à l'urgence, a group concerned with the quality of health care in the region, said Outaouais patients are forced to go to Ottawa far too often because of a lack of resources in the region -- something she feels should never have to happen. Ms. Robitaille said that what happened to Dany is a potential consequence of the region's two biggest health-care problems: underfunding and a lack of organization. Bernard Chagnon, a spokesman for the Outaouais health and social services agency, said the agency is working with the regional health centres to better co-ordinate situations where patients need to be transferred. Though the practice has always occurred, it has traditionally been done in an informal way. Mr. Chagnon could not say when a more formal process would be put in place. - Thursday Oct. 11, 11 p.m. -- Dany Bureau starts to feel pains in his stomach. He goes to sleep thinking he just has a stomach ache. - Friday Oct. 12, 3 p.m. -- Since the pain has not gone away, Mr. Bureau and his mother go to the Wakefield hospital to have him checked out. - At Wakefield's Gatineau Memorial hospital, a doctor determines that there is a problem with Mr. Bureau's appendix. Calls are made to hospitals in Hull, Gatineau, Maniwaki, Buckingham and Ottawa to find a surgeon. A surgeon cannot be found. - 8:25 p.m. -- Robert Bureau, Dany's father, receives a call informing him that a surgeon is available at the Montreal General Hospital. - 8:30 p.m. -- Mr. Bureau leaves his home in Aylmer for Montreal. - 8:37 p.m. -- The ambulance leaves Wakefield hospital with Mr. Bureau. - 10:45 p.m. -- Robert Bureau arrives at the Montreal General Hospital. - Saturday, Oct. 13, 12:15 a.m. -- The ambulance with Dany Bureau arrives at the Montreal General Hospital after missing the Décarie exit and then mistakenly unloading him at the Montreal Children's Hospital. The surgeon who had been awaiting Dany Bureau's arrival has since become occupied with another trauma case. - Oct. 14, 12:10 a.m. -- The surgeon who operated on Dany Bureau tells his father that his appendix had burst and that he had developed peritonitis. As a result, he is hospitalized for several days so his recovery can be monitored. Wow, that is just pathetic. Letting somebody get peritonitis with a known diagnosis of appendicitis. Hearing about someone getting peritonitis from a burst appendix always makes me roll around on the floor laughing too. Anyway bhk, if you haven't already, you should check out the Quebec-made film, The Barbarian Invasions. You would love it. Health service dentists have been forced to go on holiday or spend time on the golf course this month despite millions of patients being denied dental care. Many have fulfilled their annual work quotas allotted by the National Health Service and have been turning patients away because they are not paid to do extra work. This is despite the fact that more than 7m people in Britain are unable to find an NHS dentist. Patients have been told they must either pay privately or return in April when the new work year begins. People suffering from toothache have been advised to go to hospital. Areas affected include Merseyside, Derbyshire, Birmingham and East Sussex. Eddie Crouch, secretary of the Birmingham local dental committee, estimates that up to a third of dentists in the West Midlands have run out of work or have had to reduce the number of NHS patients they treat. “Patients in pain have had to shop around to find a dentist that has not used up their quota,” he said. The British Dental Association fears that other dentists have been unable to meet their quotas and will be forced to pay back thousands of pounds to the NHS. The health department says dentists should have managed their workload throughout the year. sorry to resurrect an old thread but I didn't think the story needed a new one. Wow, these dentists get what amounts to a few months unpaid vacation. I'd go crazy if I had to take more than 4-5 weeks off at a time. Though, I would rather find something to do than to work for free. Why can't these dentists work privately, and make some cash on the side. Seems like a great opportunity for them while alleviating the toothaches. Hmm... This thread is about dentists, and you do realize that dentists in Canada are private, right? The title says "Nationalized Healthcare". Good for the dentists not to be railroaded into the Canadian NHS.